Have you ever experienced a lightning strike when reading a book, listening to a song, or staring at a painting? That thing that’s been hanging in the background emerges with a clear path ahead of it. You know what to do—how to paint that portrait, how to sing that song, how to frame that book. It’s as if all the ideas in the universe came together at that moment to clear the way for one big idea—an idea that relied on you being in that exact place and time. 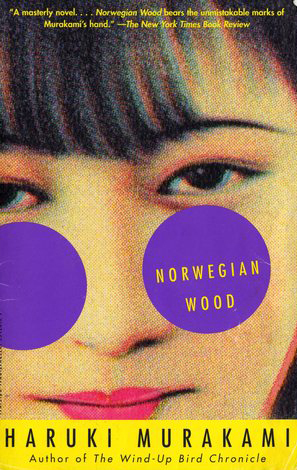 This week I’ve been going back and forth between Haruki Murakami’s Norwegian Wood and Jeff Goins’ Real Artists Don’t Starve. I typed it into my file of lines—those strands of words that double as defibrillators for my brain. When I stall, a read of those lines gets the noggin’ pumping again. So it was with that line in my head that I started reading Real Artists Don’t Starve. 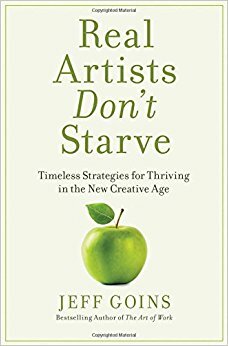 The back cover says the book debunks the myth of the starving artist. 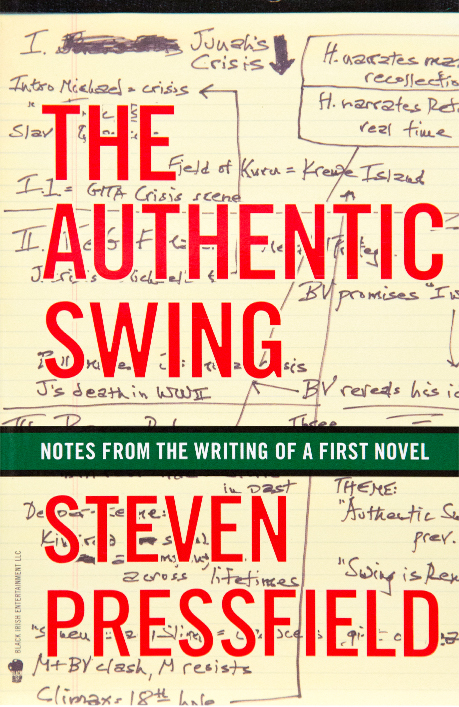 While that might be what it is about, the book itself is an example of connecting the dots, which is what Greats do best. The book starts with a story about Professor Rab Hatfield. Hatfield was in Florence researching Michelangelo. Next thing he knew . . . yada yada yada . . . Hatfield shattered what we thought we knew about the famed artist. Turns out he was a fat cat, full of dough. Hatfield tracked down 500 year old bank records that challenged the myth. Jeff’s point in this story is that Michelangelo wasn’t broke—and artists today don’t have to be broke either. I agree. I hate the starving artist narrative. Everytime I meet art students, I beg them to take at least one course on contracts and basic accounting. This is the same advice you might give to someone buying a car or a house. You don’t have to be an expert, but you do need to know enough to identify when you’re getting screwed—or on the other hand, when a good deal is staring you in the face. What got me thinking in the Michaelangelo story, though, wasn’t related to the artist, but to the professor instead. The information was out there. The professor wasn’t the first to dig around in the files. And yet . . . That bit of magic occurred when he was traveling one track and then . . . BOOM! Lightning strikes and operates like a train switch. New track. Instead of staying on track he flung open the door and on the other side made a discovery. Had he kept his blinders on, there’s a good chance Jeff wouldn’t be writing about him, nor would I. But he did go off track and he did connect the dots. 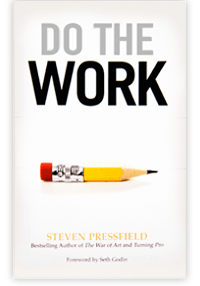 Many of the articles and books and interviews Jeff cited are new to me. 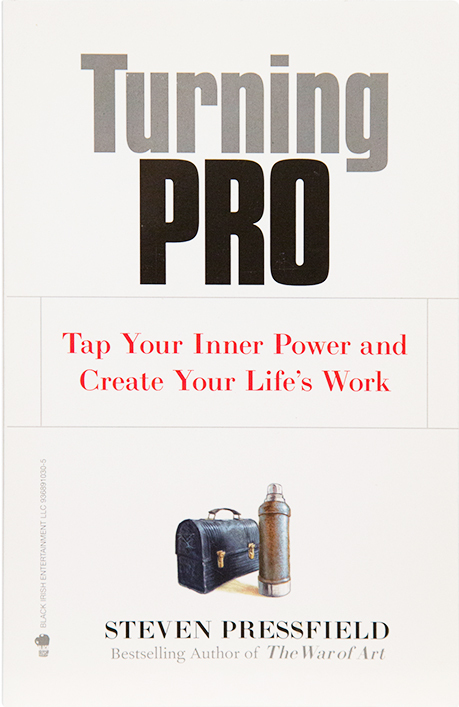 Thus, had I sat down to write this book it would have been completely different. He was a specific person in a specific time with specific background and specific experiences. The result? He connected the dots for the rest of us. What does this mean for the rest of us, trying to write our own books? We can’t predict the best time and place for the magic to take place, but . . .
We can open the door. In order to connect the dots, Professor Hatfield had to open the door. When he started straying off track, which will happen with research, he kept going. While reading the resource list at the back of Real Artists Don’t Starve, I imagined Jeff doing the same, going down the rabbit hole of research, without getting lost—with the ability to distinguish a door from a dead end. This is what great artists do. But in order to connect the magnificent great big idea dots, they have to have boatloads of smaller idea dots. If you limit your intake, you’ll limit your output. The more ideas entering your noggin’ the more it’ll have to chew on—and the more likely it is that you’ll be a recipient of a bit of magic. 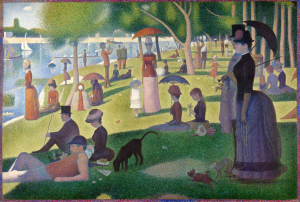 Imagine Georges Seurat sitting in front of his canvas, one dot at a time until “A Sunday Afternoon on the Island of La Grande Jatte” emerged. Had he combined the wrong colors . . . Used fewer “dots” . . . Instead, he put the dots together and . . .
“…defibrillators for my brain.” Oh, how I love that image, Callie! I’ve got 3-ring binders full, ok, and Evernote. Now I know what to call them! None of us create in a vaccuum. We are what we collect and curate, in our minds and hearts, as well as our treasure troves of ideas. I LOVE THIS POST! I’m with Mia (again)! Your line “defibrillators for my brain” really grabbed me and I realize that I need to start my own file for these lines when they come – and they do come if you are paying attention. The older I get the more moments I have when the universe puts those dots out there and invites you to connect them. Thank you SO much for this post. It really hit me between the eyes (and your posts do that more often than not). DITTO with all Mia and Mary have written. I have a list of these that is constantly evolving. I just run through them occasionally when I need a nudge in another direction. If you don’t have your own (yet) or need another nudge, try it at http://zaml.us/. The Murakami quote is now in the list. Thank you for this. I like the metaphor of defibrillator for the brain. Food for thought. We think what we read. I want to know what everyone else knows or is thinking, so I should read what everyone else is reading. But, I need to read books that everyone else is not reading so I won’t think the same things as everyone else. Okay. That sounds like a lot of reading, but I can do it. Fitzgerald’s stewardess would probably think that Hannibal Lecter was a nice person because he would wrap up his gum (or anyone he didn’t want to swallow) before throwing it away. I saw that Murakami quote somewhere else this past week, too: “If you only read the books that everyone else is reading, you can only think what everyone else is thinking.” Discovery is fun. Love that “rabbit hole of research” — that’s exactly what it is! This was awesome! I love connecting dots from experience, and I love when others share their connections. It requires deep thought and an ability to “see” what wasn’t obvious…or to see what is so obvious it isn’t easily recognized. While I completely agree with the main point of your article, I strongly disagree with the quote you use to support your argument. I don’t think anybody reads a book exactly the same way as everybody else. We always read through the filter of own ideas, educational background, life experiences, thought processes, etc. In fact, even on re-reading the same book we get different insights beyond what we “learned” on the initial reading. That’s what makes books so great. 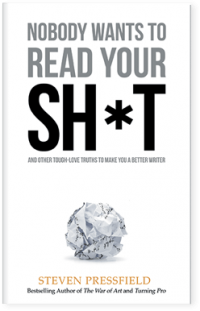 I need this damn book — right now! Thanks SP. The Goins book hit my radar in the past couple of weeks. Thought there was a podcast on it but only found episodes with the previous book. Speaking of expanding our minds with ideas tons of great podcasts with interesting people and topics out there!